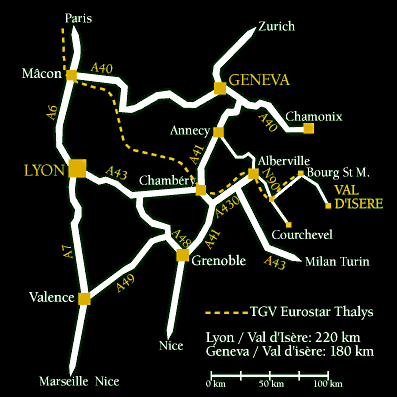 Depending where you leave from, join the A43 motorway (“autoroute”) at Lyon , Chambéry or Albertville . Continue towards Bourg Saint Maurice. Follow the signs to Val d’Isère and Tignes. In Val d’Isère, follow the signs “Centre des Congrès Henri Oreiller” then see the plan for the situation of the Lodge. By TGV from Paris and Lyon to Bourg Saint Maurice then coach or taxi from the station. A seven seats Audi Q7 for a transfer between main line stations and airports or for a single trip to a restaurant in the resort, they will be able to satisfy you.